I love buying vintage typewriters and ripping their guts out. There, I said it. I knew I had a problem when I'd destroyed three typewriters and only had one ring to show for it. I forbade myself from buying any more typewriters until I used up the ones I'd already wrecked. So of course I had a bag of keys and innards in my miscellaneous crafts box for roughly five years. But no more! Today I unearthed them so they can live anew. If you don't have a shameful stash like me, you can purchase keys online or keep an eye out for your own typewriter to destroy! Bwah-ha-ha! upcyle. Optional-clamp to hold keys while you cut them down. Mine is wooden. Any kind will work, but one with a flat edge makes a nice cutting guide. You may not need this if your keys are already thin and flat. Ring blanks (available online, I like Rings & Things http://www.rings-things.com/ for a wide range of jewelry making supplies). As always, protect your work surface. Prepare your coping saw. If you haven't used one, I'll be adding a page soon with some basic craft techniques so check back later! Clamp the key as shown at right so a little over 1/8" is protruding. Use a thick book or similar item to elevate your clamp. Otherwise it's hard to saw down to the bottom. Brace the clamp with one hand and applying gentle pressure saw through the key. It will look like the picture below on the left. Your key will probably have some rough edges. 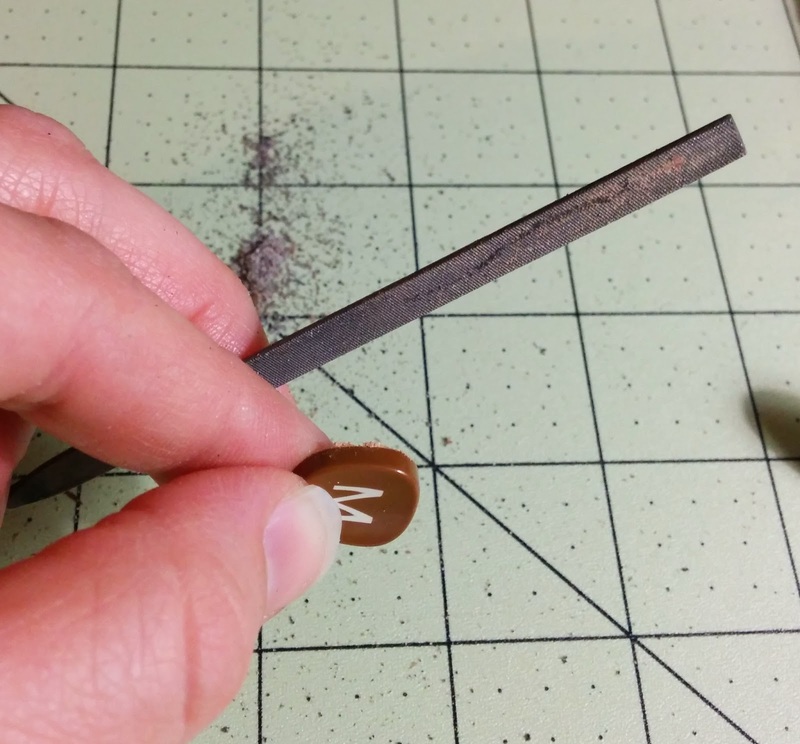 Use your file and sandpaper to smooth them down. 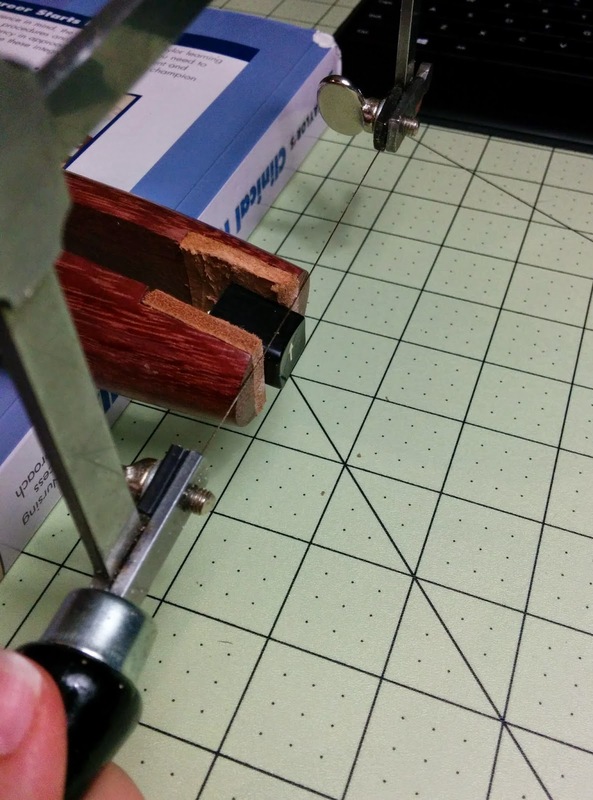 Before gluing things together, you should rough up the surface a bit to improve adherence. 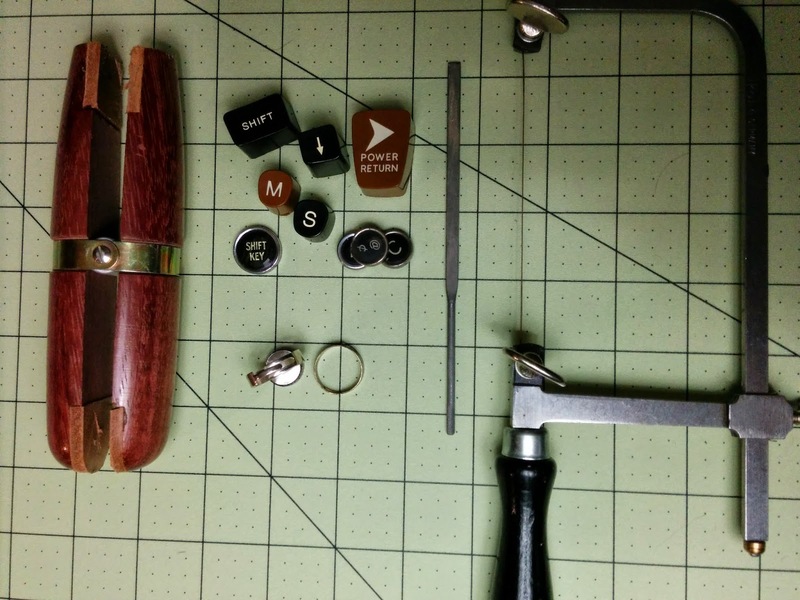 Use your file to lightly abrade the back of the key and the top of the ring blank. Clean out any plastic dust. 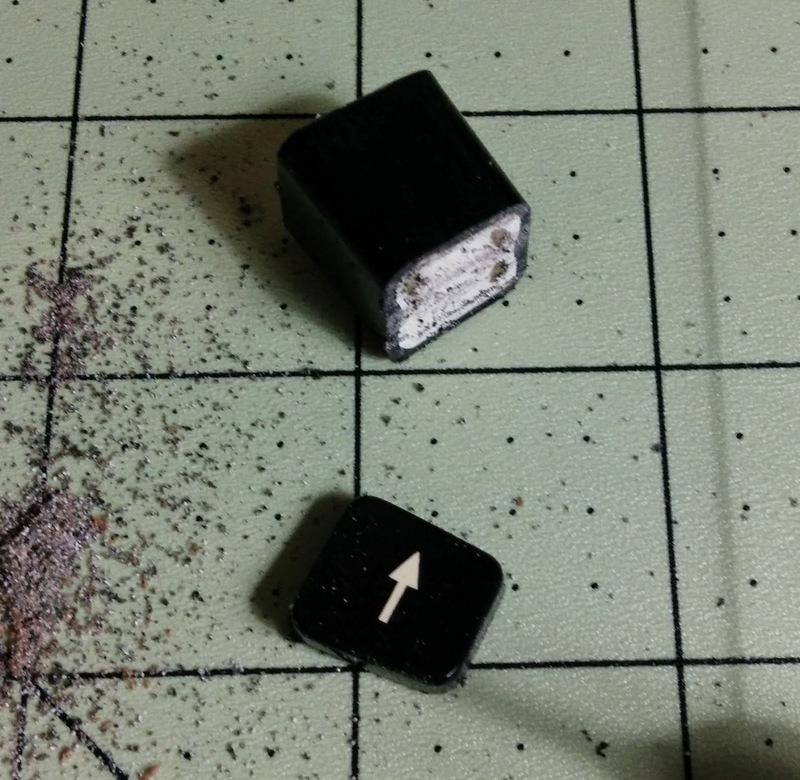 Decide how you want to position the key on the ring blank. Once you glue it there's no going back. Turn the key face down. Apply several drops of super glue, epoxy, or glue of your choice. Press the ring blank gently into place. You only have a couple of seconds before the glue sets, so work fast! Use firm pressure to hold the key and ring together for 20 seconds while the glue sets. Set aside and allow to cure for a couple of hours before wearing. Enjoy and don't forget to post pics for us to ooh and aah over! You can use these as charms, pendants, barrettes...the sky's the limit! The quickest way to make a charm is drill a small hole and add a jump ring, but you can buy other types of backings and bails online. 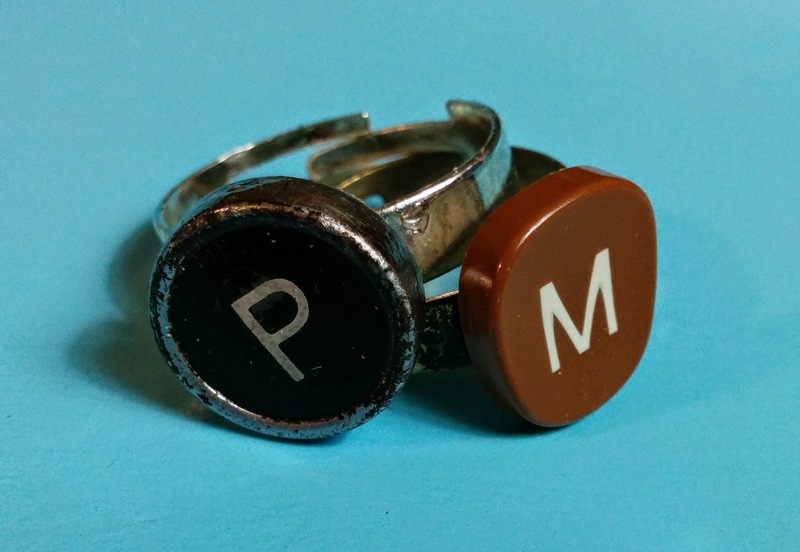 You can glue almost anything to a ring blank, for example vintage buttons, vintage clip on earrings (remove the clip and glue on), things you create with shrink film (Shrinky Dinks are made of this), old gears or watches, etc. Have fun finding things to turn into fabulous jewelry.